The first three slide charts on this page are ones that were given to me whilst I worked for the British Aircraft Corporation and its successor, British Aerospace. In my early days with the Company I led a programme of research into the effects of vibration on bolted joints and how to maintain joint integrity. Later on I became Chief Engineer of the Underwater Research & Engineering Unit of BAe in Weymouth and much involved in sonar. The first three slide charts reflect these activities. 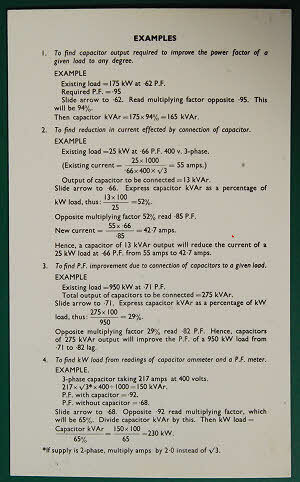 A double sided slide chart made for Unbrako by IWA (no. 05 171). The upper side gives the dimensions for different types of bolt and screw made by Unbrako, mainly to DIN standards. It also gives axial force for a combined stress equal to 90% yield stress and the tightening torque to give the corresponding clamping load assuming the coefficient of friction = 0.125. The under side enables the required preload for a given external load to be calculated for a variety of joint configurations and hence, for a given method of tightening and bolt strength grade, the bolt size required. It was originally supplied with red and green tongues for imperial and metric units respectively but I only have the red one. GKN Screws & Fasteners Ltd, Heath Street Division “Engineer’s Companion”. A simple, double sided, conversion chart for length, volume, weight, pressure, viscosity, speed, fuel consumption, torque, temperature, and energy between various metric and imperial units. It is contained in a vinyl wallet which also holds a tablet for converting mm to inches and inch fractions to decimals and mm. Made by UK Plastics, Petersfield. Sperry Sonar Propagation and Transducer Computer made by Perrygraf in the USA; copyright Sperry, 1980. The upper side enables the directivity index and beamwidth to be calculated for a transducer or array given the frequency and diameter or length. It also gives 10logA and 20logA for values of A, to give values in dB. The under side enables various factors to be calculated for use in the sonar equation. These include attenuation with range dependent on frequency, ambient noise against sea state again dependent on frequency, and spreading loss versus range. There are also some conversions between imperial and metric and a calculator for depth given horizontal range and depression angle. The computer has a vinyl wallet which also contains an instruction booklet for its use. Model M Gisholt Time Computer manufactured for Gisholt by Perrygraf. ©1964. 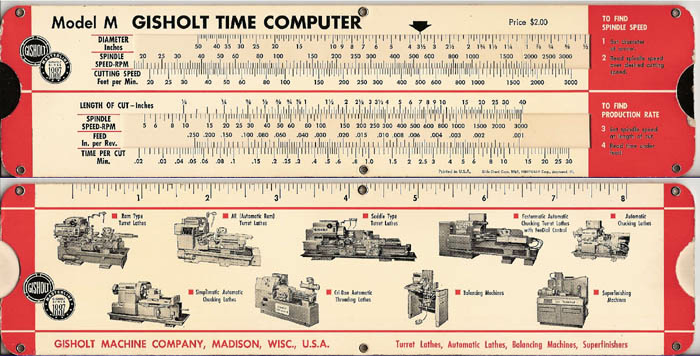 A simple machining time calculator. The spindle speed is first determined from the diameter of cut and the cutting speed. 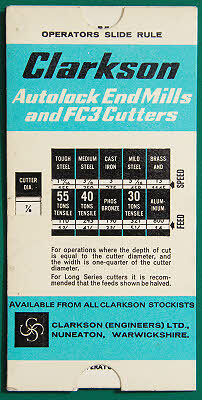 Then using this with the length of cut and the feed rate the time per cut can be found. 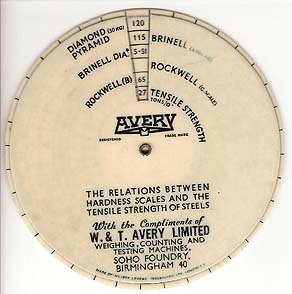 Chart for the relations between hardness scales and the tensile strength of steels, with the complements of W & T Avery Limited, Weighing, Counting & Testing Machines, Soho Foundry, Birmingham 40. Made by Millett Levens (Engravers) Ltd, London E3. The hardness scales are: Diamond Pyramid (30 kg); Brinell; Brinell dia; Rockwell (C scale); Rockwell (B); together with Tensile Strength (tons/sq. in). Plastic version of the Model M Gisholt Time Computer ©1951. Manufacturer unknown. Both this and the one above have faux leather slip cases. Rodney metals card weight calculator, made by Perrygraf, ©1968. It caters for stainless steel, titanium, nickel, and nickel alloys. Using the front side, the width is set opposite the thickness on the top scales. Using the scales for the appropriate metal the weight can then be read off against the length. On the reverse the weight of coiled strip can be calculated on the upper scales based on the inside and outside diameter of the coil. Factors are given for metals other than stainless steel and it also needs to be factored by the width of the coiled metal in cm. The lower scales are conventional C & D scales for multiplication & division (factoring). lines are: Asmiddellijn; Breedte v. d. Spie; Hoogte v. d. Spie; Diepte spie i/h hart; Diepte spie o/K Kant. Sperry Sonar Propagation and Transducer Computer made by Perrygraf in the USA; copyright Sperry,1958. This earlier version is basically the same on the upper (Transducer) face. However the lower (sonar propagation) face differs in layout. There is a slide for calculating destroyer radiated noise but there is no slide for calculating depth from depression angle and range, or a conversion slide. Clevite Vibration Computer made by Perrygraf for the Piezoelectric Division of Clevite. The riveted card construction is typical of Perrygraf slide charts. Dated 1959. The upper face enables acceleration and velocity at displacement to be read once the frequency is set, for either linear or angular acceleration. The other face enables acceleration density or rms acceleration to be calculated. Double Sharp weight calculator made for James Austin & Sons (Dewsbury) Ltd. 10” length overall, laminated plastic. 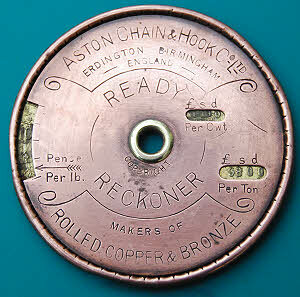 Aston Chain & Hook Co Ltd, Erdington, Birmingham, Makers of Rolled Copper & Bronze, Makers of Rolled Brass Strip, Ready Reckoner and Imperial Standard Wire Gauge. The upper rotating face is copper and converts pence per pound to £sd per cwt and £sd per ton. The other rotating face is brass and gives the size in thousandths of an inch for each SWG number. 2.1” diameter. Early 20th century. Clarkson Operators Slide Rule. Clarkson were makers of Autolock chucks for holding end mills and slot drills in vertical milling machines. 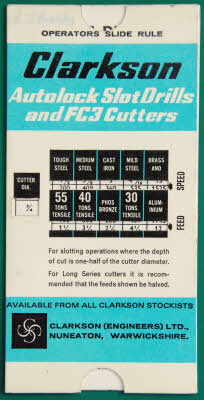 Given the cutter diameter this chart gave the speeds and feeds for use with a variety of metals. Sandvik Machining Calculator for turning and milling. 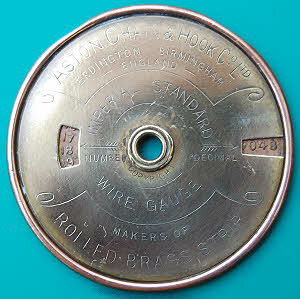 This is a rather more complex example than the Clarkson one above as it covers both milling and turning (on a lathe). 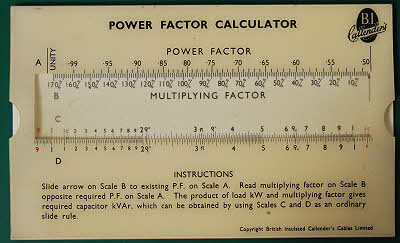 It also considers depth of cut and calculates power requirements. It has two slides. It has a blue vinyl slip case. Omaro P1 weight calculator for steel & iron plates, squares, sheets, flats and sections.It also gives cross-section areas for the steel sections. 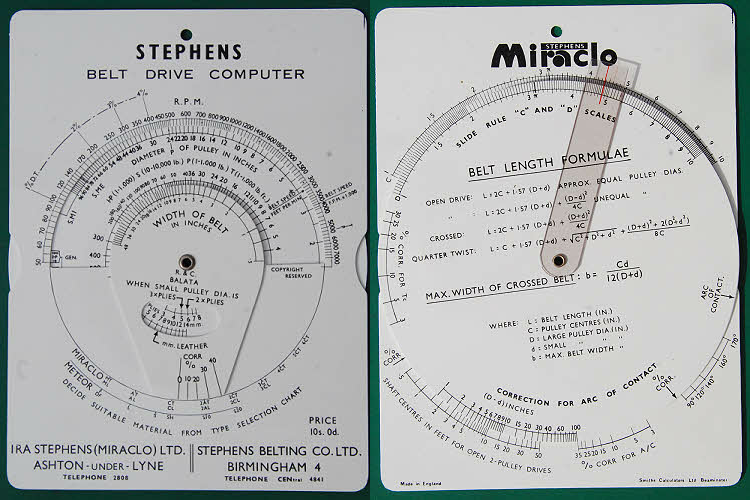 Stephens Miraclo Belt Drive Computer made by Smith’s Calculators Ltd of Beaminster, Dorset. Miraclo made a range of types of drive belt.The instruction sheet has a chart from which the type of belt is first selected. From the rpm of the faster shaft and smaller pulley diameter the width of belt is selected against horsepower. Various corrections are then found from the back of the computer and the pulley diameter is reset against rpm and the calculation repeated. It can also calculate other parameters as well. 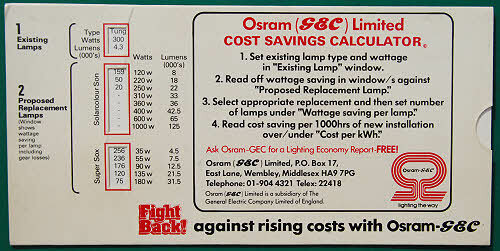 Osram (GEC) Limited Cost Savings Calculator made by Fyfe Carnegie Ltd, Chichester. 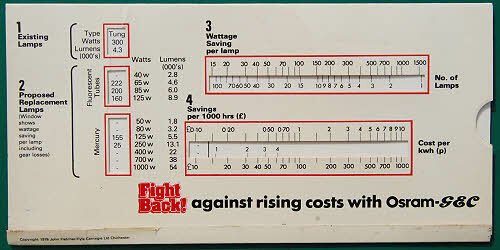 This calculates the saving in electricity wattage and cost for various replacement light types compared to existing (Tungsten). The proposed replacement lamps are fluorescent, mercury, Solacolour Son, and Super Sox. 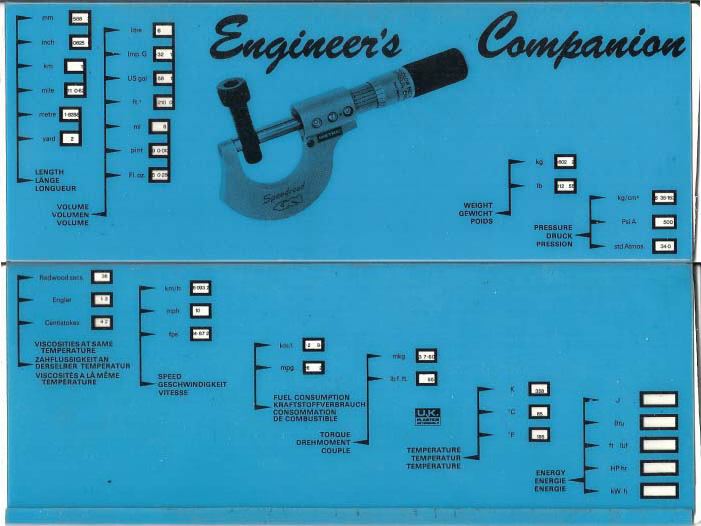 Audco Control Valves slide chart made by Smiths Calculators, Beaminster, Dorset. It has scales for steam gases and liquids. The outer is folded plastic and the inner sheet plastic, both screen printed. 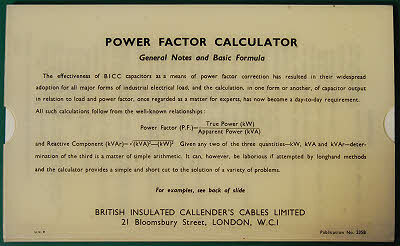 I have another Audco calculator, in circular format, by Fearns Mear & Co that is also for calculating pipe flow, but only turbulent flow.